Another in my collection which I know nothing about. Hopefully someone will have an idea? It appears to be old blue and white-ish. It stands 25cm tall (with lid on). I have enclosed a pic of the mark. Any help will be very appreciated. Comments for Any ideas on this unusual vase? Even with a needle you cannot feel the cracks? That is double strange, in my view. Based on the picture it looks as if the bottom is flat or almost flat, without foot rim. Also, it seems strange how the lines of the crazing are much stronger below the glaze?! Normally, dark lines mean that something seeped into the cracks, making them more obvious. And that would have happened after firing. How comes this happened in this way, if the glaze was completely smooth and fired at a high temperature? The vitrification of the glaze would not allow any substance enter the cracks. This bottom leaves too many questions open for my taste. Hi Peter - many thanks for that. I did wonder with the 'flo-blue' pattern - not very oriental! It is difficult to tell with the mark. The base feels completely smooth - even the crackle appears to be underneath. Now I am in a quandary as to whether to keep it in the collection or not. I am getting a bit over crowded so need to thin it out. 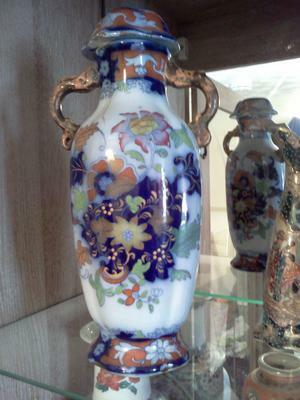 There is nothing Chinese about this vase. Normally, this would be an European style item. The Jiaqing mark looks as if it were made with a printer font, not hand drawn. 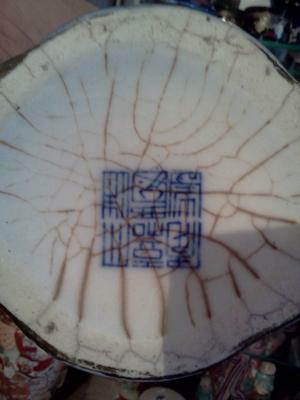 If it is added on top of the glaze, then it was possibly added later to pass off the item as Chinese, although that would be difficult with this type of decoration.